Raise your hand if you really aren’t into the overly bright, multi-colored, often plastic mobiles you see in the big toy stores? Yep, me too. 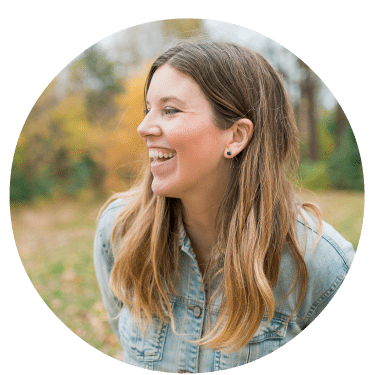 That’s not to say that I haven’t seen super cute ones at the boutique type baby shops and of course oodles of sweet options on Etsy, but for James’s room we were trying to keep costs super on point, so I knew I needed to come up with something budget-friendly. 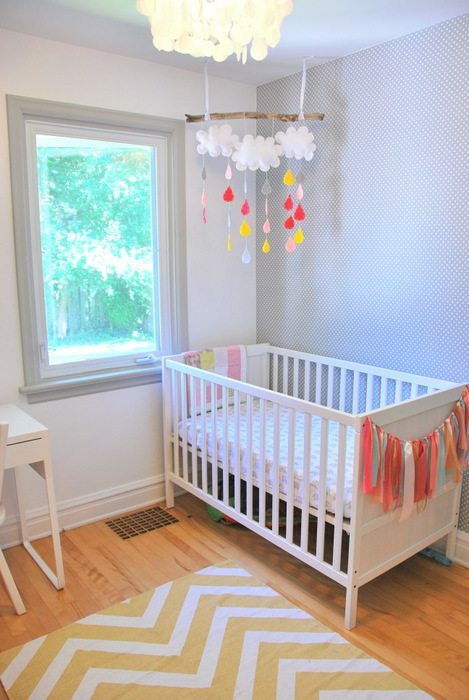 I was also running short on time as we only started decorating his room late into my third trimester…. 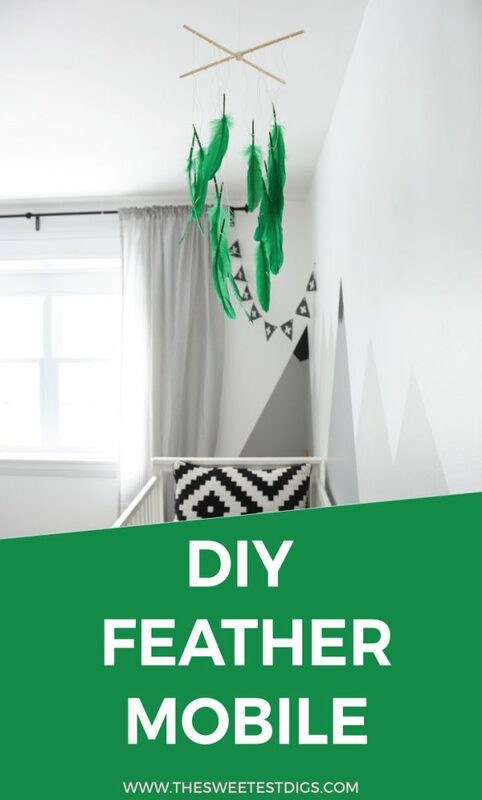 Enter this DIY feather mobile! 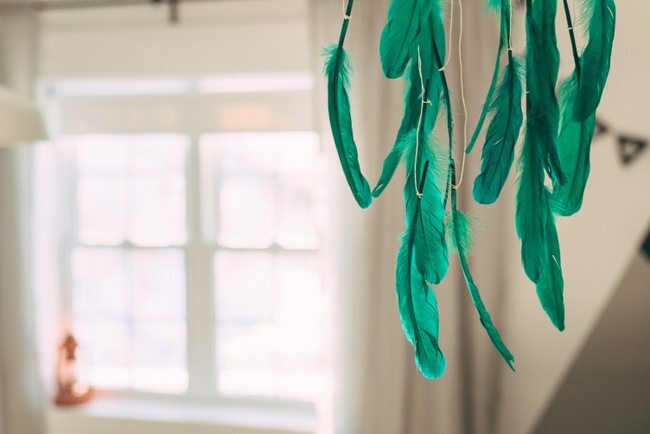 The nursery was shaping up to have a camping / outdoor / adventure vibe with the mountain mural and black, white, and kelly green scheme, so when I came across some green feathers at the dollar store that were a perfect color match, inspiration hit! String – I used a white string because I had it already, but some invisible string like this would be even better! You can get all of these supplies really cheaply, so the whole thing costs less than 10 bucks! First up, tie some string around the center of the two pieces of dowel to create a ‘T’ shape. 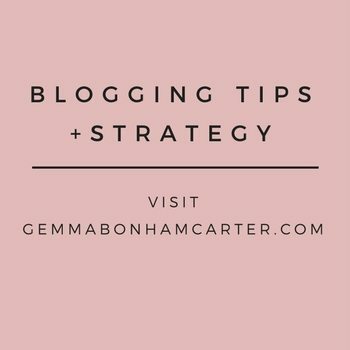 This will make up the top piece of your mobile. Simply wrap the string around a bunch of times, tie in a knot, and cut off the excess. 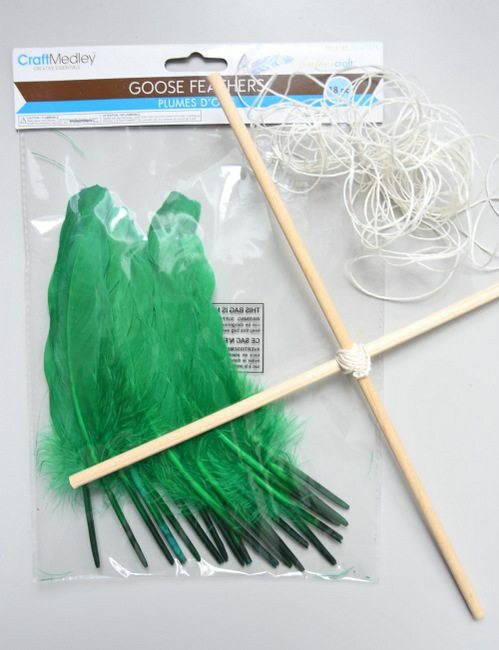 Then you need to tie some string to each individual feather. 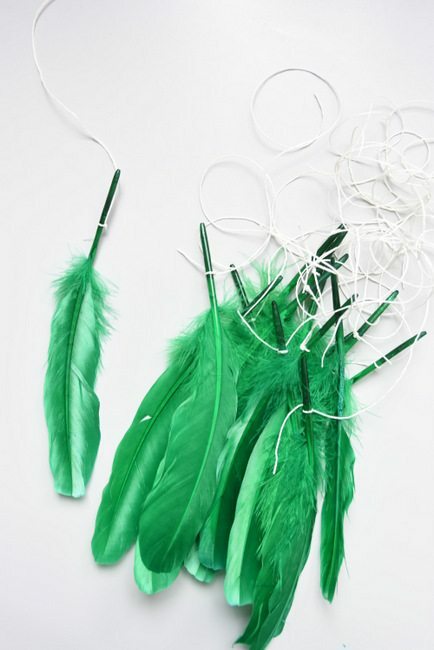 I did a tight double knot about halfway up from the bottom of each feather. Do a bunch of these and vary the length of the string here and there. Then it’s just a matter of tying each string to the dowels. 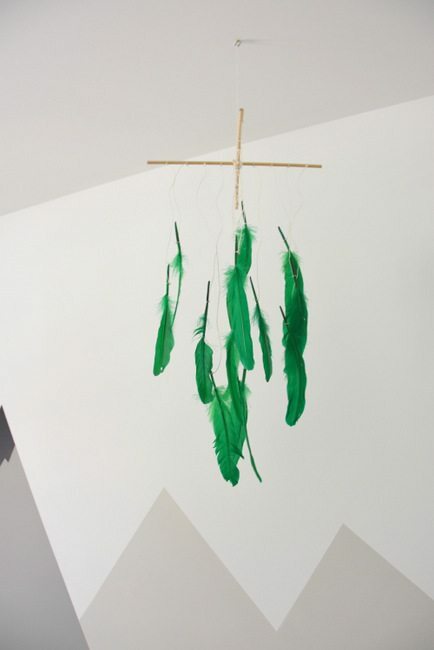 I put 3 feathers on each of the 4 lengths of dowel and randomly varied the height at which they hung, to make sure it didn’t look too uniform or precise. To hang it up, we screwed an eye hook into the ceiling and then ran a piece of string from the middle of the dowel up to the hook. Even though it’s white string, you can barely see it. 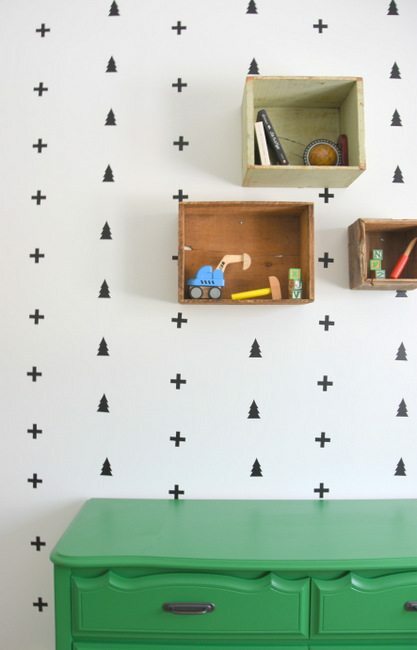 Projects that cost a couple of bucks, take a few minutes to whip together, and look this cute? Winning. I love how it brings the green over to that side of the room. It needed a little color and this is perfect. 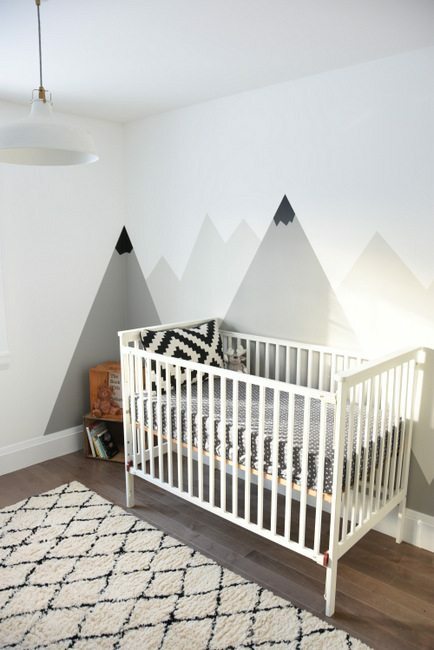 The DIY painted mountain wall mural! 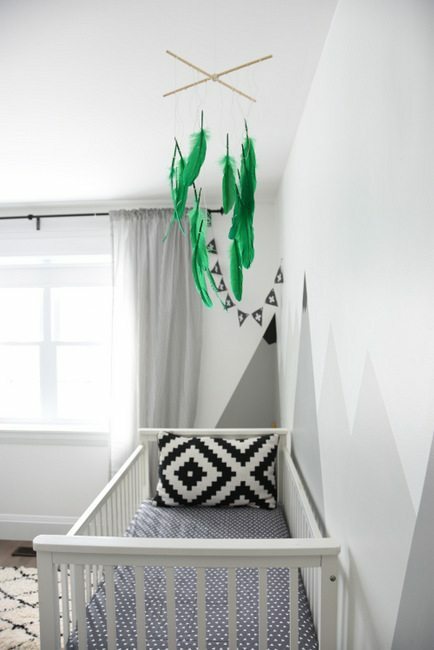 Oh and if you’re looking for another mobile idea, here is the DIY raindrop mobile I made for Maya’s room just before she was born. It was definitely a more time-consuming project, but it has a really sweet vibe.